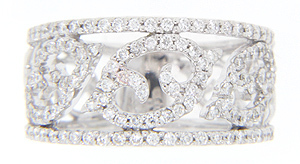 Ovals covered in diamonds are the primary feature of this 14K white gold antique style wedding band. Diamond covered curves intersect with the ovals at various points. 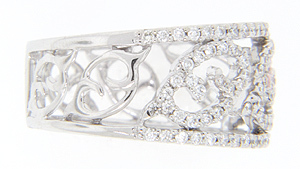 The ring,s edges are studded with diamonds and serve to frame the central design. 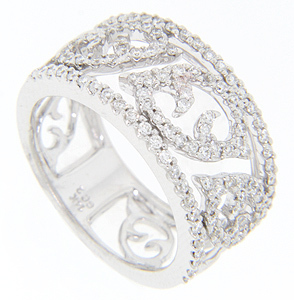 Approximately .70 carats total weight of diamonds are set in the ring. The wedding ring measures 11mm in width. Size: 6 1/2. We can re-size.